In a special convocation held in the main campus on 15 March 2019, the University confered Honorary Doctorate of Doctor of Letters to Prof. Dr. Jean-Claude Badoux, distinguished Swiss civil engineer and Honorary President of Swiss Federal Institute of Technology Lausanne. Rt. Hon'ble Prime Minister Mr. KP Sharma Oli, Chancellor of the University, confered the Degree to Prof. Badoux, in the special function attended by University Senators, ministers, lawmakers, foreign diplomats, representatives from local bodies, members of the University family, and other distinguished personalities representing various institutions at home and abroad. Dr. Badoux is a great friend of Nepal and Kathmandu University. He has been instrumental in the inception of academic programs in biotechnology, geomatics engineering and civil engineering as well as Energy Research, Development and Consultancy emphasizing the linkage between academia and industry at Kathmandu University. 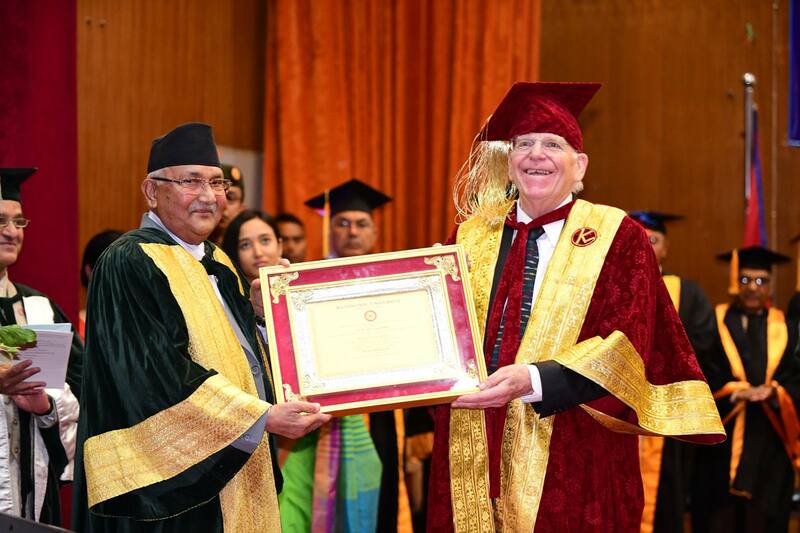 The University awarded the first Honorary Doctor of Letters in 2011 to Mr. Satyamohan Joshi, a prominent author and scholar in Nepalese culture. The same year, the University awarded Honorary D. Litt. to Dr. Karan Singh, a well-known scholar and statesman from India. In 2016, the University conferred D. Litt. To Sri Pranab Mukharjee, the then President of India.